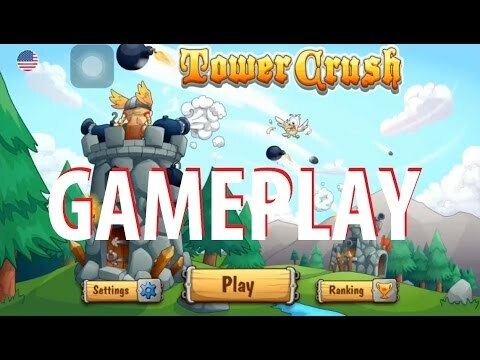 Hello guys, today we are looking at Tower Crush published by Impossible Apps. Tower Crush it’s a tower defense game. It’s hard to be innovative in this games but Tower Crush it’s a bit different. You just have one tower with several floors each one of those with a weapon that you choose to place. You can upgrade the stories and the weapons. Tower Crush is an epic indie game where you build 1 tower, up to 6 floors, load them with weapons, upgrade, evolve and defeat your opponents in fantastic battles. A combination of action and strategy. Don’t fear, you’ll collect Machine Guns, Cannons, Flame Guns, Rocket Launchers, Lasers, Teslas, and Mighty Plasma Canons to help defend your tower. Unleash the most devastating special powers upon your enemies. And now let`s get to the gameplay review section. Mobile games are mostly casual, and this one does the trick quite well. You have 250 levels of tower defense battles. You just have to keep upgrading floors and weapons. I have some issues with gameplay. You have to select your floors and then the enemy’s floor that you want to attack. After you destroy that floor you have to do all again, but at that time the enemy is still attacking you. Maybe it can be an option to automatically attack other floors even if in the full version of the game. Build a reputation for brilliant strategy & ruthless energy. Wield blazing weaponry. Construct the ultimate tower. Up to 6 lower floors. 7 insane weapons of destruction. 6 brave heroes to combat your opponents (Warrior, Paladin, Undead, Orc, Viking, and Wizard). 170 levels in the campaign mode. 7 special powers (Ice, Shield, Healing, Rain of Fire, Thunder Storm, Tornado and Poison). Ad-free play with an in-app purchase. Unlimited battles & fun. In my opinion, this is a great game!